Television, video games, and computers are easily accessible to twenty-first-century children, but what impact do they have on creativity and imagination? 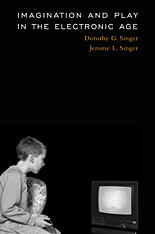 In this book, two wise and long-admired observers of children’s make-believe look at the cognitive and moral potential—and concern—created by electronic media. As Dorothy and Jerome Singer show, violent images in games and TV are as toxic as many observers have feared by stimulating destructive ideas and troubling aggression. But should all electronic media be banned from children’s lives? Calmly and authoritatively, the Singers argue that in fact some screen time can enrich children’s creativity and play, and can even promote school readiness. With guidance from parents and teachers, empathy, creativity, and imagination can expand and intensify in the electronic age.